It happens to most retailers almost every day and it’s generating staggering losses. 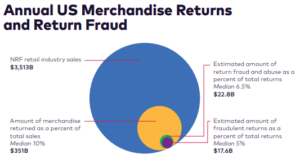 Losses from annual merchandise return fraud are estimated at $17.6 billion dollars* each year. The methods of return fraud can vary from basic fraud using on-site merchandise and receipts to more advanced methods which utilize technology to perpetrate fraud. The devastating impact of return fraud can be mitigated by making sure your team is aware of the many techniques used to commit fraud. A customer will shoplift and return an item, without a receipt, for cash. An item can be purchased for cash, then shoplifted, and returned with a receipt, for cash. Another method is using a receipt taken from cashier’s trash can or dumpster. A perpetrator will shoplift the same item(s) listed on the receipt. The items will then be returned, with a receipt, for cash. Merchandise can be purchased on sale and then returned, for the full price of the item. Packaged or boxed items are also prime targets of return fraud. A boxed/packaged item is purchased with cash. The item is then replaced with a similar, weighted object, and returned for cash using a receipt. The perpetrator now has the cash AND the purchased item. Return fraud using a credit card is possible too. A purchase is made using a credit card. Then the same item is shoplifted and returned, with a receipt. A credit is issued back to the credit card. Technology is a tremendous tool, but it can benefit those committing return fraud too. There are many websites that provide UPC codes and false receipts—for FREE. These websites lend themselves to more organized and advanced methods of fraud. A false UPC code is created and brought to the store. The false UPC code, for a lower priced and similar item, is used to replace the UPC code on similar, but higher priced item. The item is then purchased at a lower price, as displayed by the false, lower priced UPC code. The fake, lower priced UPC code is then removed and the item is returned displaying the higher priced UPC code without a receipt. Websites creating false receipts are also readily available. False receipts are created online and carried into the store. A product, matching the fake receipt, is then shoplifted and returned for cash. Return fraud is a serious problem for the retail industry and can never be eliminated completely. However, employee awareness, training and clearly defined return policies can go a long way in reducing your losses. *Source: National Retail Federation 2017 Organized Retail Crime Survey. Jim Close is the Director of Loss Prevention at DIGIOP, bringing over 25 years of experience in all facets of Loss Prevention. As a recognized speaker and trainer in loss prevention techniques, Jim teaches proven methods and best practices to retailers nationwide, including at our Fall 2018 Loss Prevention Seminars.